Designed for both homeowners and professionals. Ideal for a variety of applications where heavier coverage is needed when cleaning. It features a 32-ounce translucent poly bottle, plastic foaming spray nozzle that easily foams up cleaners/detergents/soap concentrates and other products containing foaming agents and an ergonomic handle for comfortable spraying. 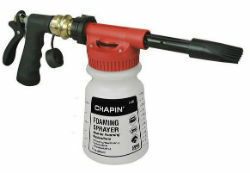 The brass quick-connect feature allows the sprayer to be quickly disconnected from the hose end for rinsing without the need for a separate spray hose end. Fits standard garden hoses, no adapter needed. Great for cleaning boats, cars, siding, livestock, pets and much more.